I know I am not very brilliant googling (it generally takes me some effort before I can zoom into the stuff I was looking for) but I was shocked beyond belief today. I use firefox (which rocks by the way) and it has the google search bar with the auto completion feature turned on. 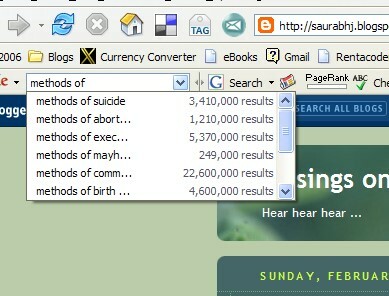 So, I start by query with “methods of …” and before I could type further, the list gets filled up with suggestions. I mean – what the hell are people searching for? There was an actual page in the “methods of suicide” search result which would be about 40 pages in printed pages – which talked about all the methods of killing yourself, along with tips, tricks and also an advice column. And if you’re still wondering if you can get rounded edges in CSS, it will be supported in CSS3 – which does not have a proper spec – so will have to wait a while. Rounded Edges….Grrr…. Tell me more man !! Sigh …. Interesting thought, it’s amazing just what you can find on Google….. maybe more than we bargain for sometimes!